On July 3, 1863, the three-day Battle of Gettysburg ended, leaving behind an estimated 51,000 total casualties – the highest number of any battle in the Civil War. Following a series of military successes in Virginia, Confederate general Robert E. Lee took his troops north in June 1863 into south-central Pennsylvania. Lee was unaware until late June that the Union’s Army of the Potomac, under General George G. Meade, had followed his army north, as Lee’s cavalry, under JEB Stuart, was separated from the main body of the army and was thus unable to provide intel on the enemy’s movements. On July 1, elements of Lee’s army came up against Union cavalry by chance outside the town of Gettysburg and fighting broke out. Both sides received reinforcements, and the Confederates were eventually able to push back the Federals to the south of Gettysburg. During the evening and the following morning, both sides gathered the rest of their armies, for a total of 83,000 Union troops and 75,000 Confederate. At the commencement of fighting the following afternoon, July 2, the Union army was arranged like a fishhook, with the Confederates surrounding them to the north and west in roughly the same shape. The 2nd saw bloody fighting on the Union left and center, but despite high casualties, the Union was generally able to repulse the Confederates. Fighting also occurred on the Union right later that evening and continued after dark in a rare night battle. On the 3rd, the Confederates once again launched an attack on the Union right, which was ultimately unsuccessful. Then, following a massive artillery bombardment, Lee attacked the Union center in what is commonly known as Pickett’s Charge. During this attack, approximately 12,000 Confederate troops crossed nearly a mile of open ground to attack Union positions but were decimated by Union fire. The Confederates who made it to the enemy lines managed to briefly break through, but they were eventually repulsed. Also on this day, the Confederate cavalry – which had arrived on the afternoon of the 2nd – was put into action off the Union right flank, but with little result. On the 4th, Lee waited for Meade’s counterattack on his position, but it never came, so Lee’s army withdrew back over the Potomac. 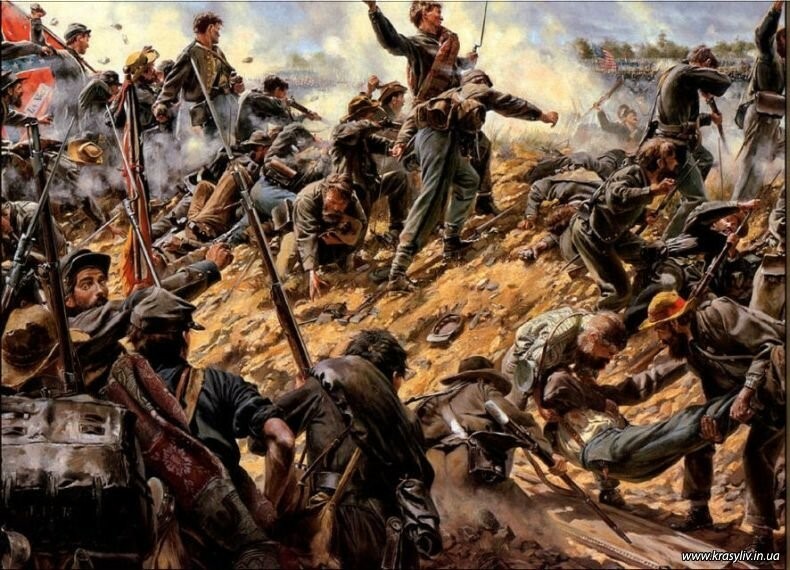 Gettysburg was the bloodiest battle of the war, with 23,000 Union casualties and 28,000 Confederate. It is often considered the turning point in the war and commonly referred to as the “high tide” of the Confederacy. ← #TributetoaVeteran – PFC Frank Plebanek, U.S. Army, 1943-1948.